Before I explain why I chose the title of my post I'll share the fun from our last week. After dropping more than a few hints to us we knew that Selah wanted her hair cut. I got busy and found somewhere to take all three girls. Their appointments were on Friday. Mariah's hair is so pretty but the longer it gets the harder it is to keep from getting tangled. I love her beautiful black hair. It is so silky smooth and shiny. So why not get a little bit silly? After all it is her personality. Then the finished product makes her even more adorable if I say so myself! I have to admit that I forgot my phone at home. I was so disappointed. I wanted photos. So I asked the girl and she was happy to take a few. Not the ones I wanted but better than nothing. Saturday I took the older two girls with me to Kmart. I just needed a few things for organizing clothing. The girls were having a little fun. They took my phone and I found this photo too! I took Mariah and Selah for labwork last week too. She came home and got right to work finding somewhere to put her stickers. One morning I came down to the school room and saw this. Okay then! On a completely different note, I am so glad that Ben has decent health insurance. Here is what his growth hormone costs for one year if the dose remains what it is now. Now to the whole "Mom of the Year" explanation. Sunday started as any other Sunday. The only child that was up without a wake-up call is Mariah. I got everyone up and moving. We went to Sunday School and then we were in the sanctuary for church at 10:30am. Mariah was being her so good and had sweetly visited with a few friends/teachers. During one of the congregationals she wanted up with me. She reached for me and I picked her up......by her hands. Oh my goodness! This is a girl who never cries with pain and she cried. My instincts told me something was wrong. I grabbed my purse and her small bag with snacks and her shot. She was hurt. She cried, and cried, and cried. She asked for Daddy. I carried her down to Jeremy's office and laid her on the floor outside his door. Kyle was helping me and got Jeremy. He came and we figured her arm was dislocated. She could not move it. I had to give her a shot. This is now the second time we have had to do this. I really did not hesitate. I know to expect this. I gave the injection. One of Jeremy's guys went to the parking lot to get our van for us. Tim took over the production part of the Fellowship Family Hour. I went up and tried to quietly get our other four kids out of the service. We rushed to the car and I held Mariah on my lap. There was no way I could strap her in her car seat with her arm hurting. Jeremy helped me into the ER with Mariah and left Rebecca with me while he quickly drove the other kids home. He made it back as we were in radiology. Mariah was really crying as they manipulated her arm. Jeremy picked her up when it was over and the crying stopped. Evidently her arm popped back in as they were positioning her. I was a little uneasy as the physician assistant told me at least five times that he knew this was not a case of abuse. Oh my goodness!!!! To think that someone would intentionally cause that kind of pain was unbelievable.It was my fault. I picked her up by her hands. Then the twist of putting her up on the pew must have done the trick. Oh I felt horrible! My poor baby! But this is what she looked like just minutes after her x-ray. I apologized to her and she just said, "It's o-tay, Mommy!" As a sweet friend mentioned to me, I wonder what Selah thought of the whole ordeal. I'm not sure. She did ask about her when we got home. Sunday night as we were saying our "goodnights" to our kids, Selah hugged me as usual but then sneaked a kiss to my cheek! First time ever! I love being a mom! Hardest job I've ever had! Yet another week has passed and I am amazed that our girls have blended in with our family so well. It has been eleven weeks since we first met Selah. Sometimes I forget that we have only been a family for that short time. What seems more unreal to us is that we have had Mariah as part of our family for 21 months tomorrow! She is 6 inches taller and 18 pounds heavier! She has hair long enough for a "nony tail" (rhymes with pony tail). She has more energy than I am sure I ever did. She loves us and I just told Jeremy yesterday that I cannot believe that she could easily be sitting in an orphanage in China still today if we had not taken her file. Thank you Lord for leading us to our youngest daughter was all those months ago! The above photo was taken at our dentist's office. Jeremy, Ben, and me had dentist appointments and we took her with us. Such a cutie patootie! Mariah still has speech therapy every Friday. Her speech appointment was at 9am for speech and our dental appointments were at 9:50. We were quite rushed to make it on time but we did. Yeah......no cavities!!! Right after lunch I took Selah and Rebecca to the Social Security office to apply for Selah's social security number. I would love to say it was easy but it was not. I had to apply without her Certificate of Citizenship. That has not been issued yet and they cannot tell me when we can expect that document. This means her card will be issued in her Chinese name until I can prove her citizenship. I only wish it would have been that easy. I took her Chinese passport, my passport, her Chinese birth certificate, and her Hague Adoption Certificate. They told me that was not enough. I then was told it will take at least six weeks. The problem is we have to file our taxes. We do not have six weeks. It appears we have a few phone calls to make this week. Selah is doing great in our family. We could not love her more than we do. What a blessing she has added to our family. I will admit that it has not been easy for us or for her. Yes she is doing well. But you cannot simply erase 14 years of neglect. We have had to learn to parent entirely different. She comes from a very different background. We cannot expect her to know immediately how a family works. She is constantly observing how we function. We have been on our knees for her praying for her heart not to be broken but we believe it was. More accurately we believe her heart has been torn into thousands of pieces. So instead we pray for the Lord to mend all the hurts of her life in China. Also for us to know how to parent her. As I have begun to teach I have discovered that she has excellent math skills. I have started her in Pre-Algebra and it is clear that so far what we are doing is mostly review. She has had very few questions in math. This past week was a bit of a realization for me. I have noticed over the past 2 1/2 months that she questions us a lot. Not out of disrespect. She just truly does not believe. Do you have any idea how difficult it is to teach a child that doubts everything? Please pray for her to begin to trust. As the past several weeks have gone by I began to notice that it is tough parenting a child who has never been parented. Not a single person in her life has invested in her. Not one! As a result she trusts no one about anything. She told me quite simply that she did not believe me when it came to a math question. It truly was not disrespectful It was just honest and abrupt (like her culture). While we honestly believe she is adjusting quite well, we also know it will take a lot of time. It will take a lot of love from us and wisdom from the Lord. We spend so much time praying over this sweet child. She deserves it! An unexpected surprise came tonight as I was getting her papers ready for school this week. I found a note written by her but not given to us. It was written on a small piece of paper that I had given her with my cell phone number. She wrote, "I'm so happy to have this family!" and she wrote that she loved each of us by name. She still guards her life before us very closely. I know it is okay. We have a lifetime to catch up. I am certain that there will be many things that will be very difficult to hear. We pray that God gives us the wisdom that we seek each day. We pray that He helps us know how to hold her and protect this sweet child. Oh how we pray that God reveals himself to her in a very real way. We smile at how God is doing small things for her. When Jeremy asked her what she has been praying for she told us that she asks God to help make her taller and gain some weight. She has grown two inches since her medical appointment in China and she has also gained five pounds. Of course her response to that was, "I do not believe." Although her adjustment has been terrific we have not shared some of these difficulties. She is a precious gem. Our hearts overflow with love for her. We knew this would not be a simple adjustment. It never is. 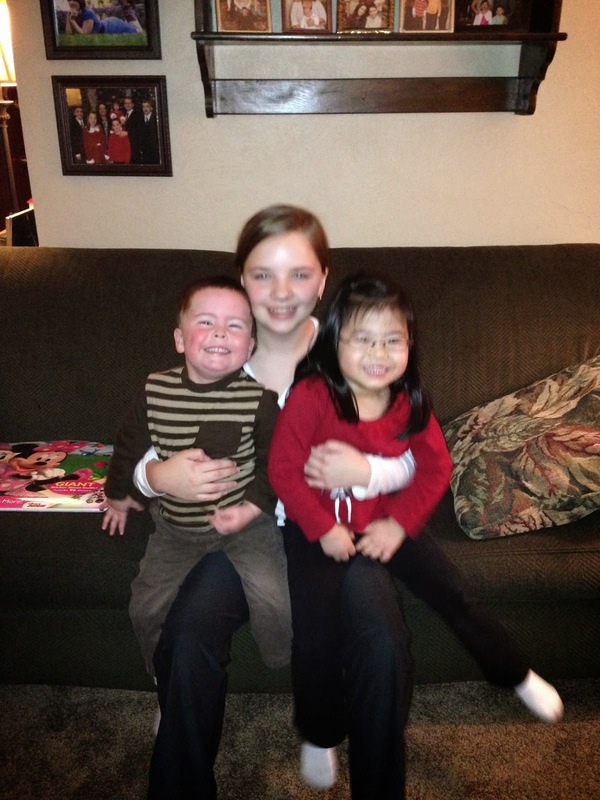 We still struggle with some orphanage behaviors with Mariah. The years Selah spent in China were very formative years. She was told how to act, how to think, and what to do with every moment of every day. That was a comfort to her. Now we begin to teach her what freedom means. We pray that she finds true freedom in God. I wanted to take a moment to ask that you lift another family before the Lord. If you remember I have asked for prayer a few times before for Lily. She is a little girl with a severe heart defect. She has had several surgeries and is in desperate need of a miracle. 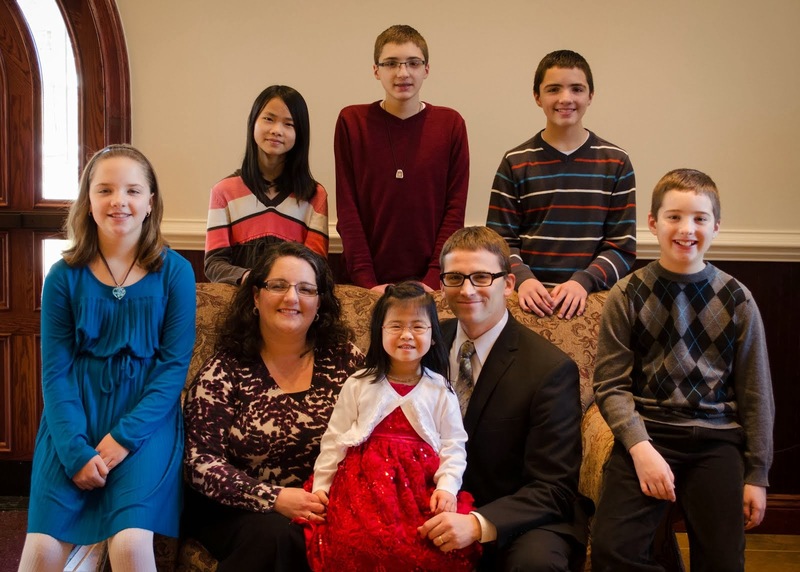 Will you pray for the Rancourt family as they struggle each day with a child who is very ill? My heart has been broken by Emily's cries to the Lord for His guidance and wisdom as they watch their four year old daughter fight for her life. We headed to Pennsylvania this past week. We got up Thursday morning around 7am and left the house at 9. This was Selah's first trip to PA to visit our families. She was pretty quiet. We loaded all six kids and some luggage into our van and made the trip to the parking lot of Pittsburgh Zoo. We met my parents there and they gave us my mom's red Chevy Impala and Jeremy, Selah, and I headed to PCH. My parents took our van with other five kids and headed home for lunch around noon. We got lunch at Wendy's and headed to a doctor appointment. We waiting for a very long time. Selah was absolutely loving my mom's car. It is a red Impala and Selah was so impressed with it. She loved riding in it! After her appointment she did not want to go back to my parent's house for supper. She was so nervous. She wanted to go home. However, she LOVED the city! For now it is obvious we have a city girl. She loved the tall buildings. I explained that our parents live in the country. She explained how confused she was. She mentioned that America is a country but I keep telling her that our parents live in the country. It completely confused her. I tried to explain that country also means farmland but that also was not entirely accurate. I will have to try again. We arrived at my parents in time for me to help with the last of dinner preparations. Selah has met our parents before. They were at the airport when we arrived from China. That was after Selah's shock of a 32 hour flight plan and sheer exhaustion. I was praying she would love it at our parents' as much as we do. She was so great. She hugged my parents and was amazed with my parents house. She investigated every cabinet, door, drawer, counter top, closet and whatever else she could find. She helped in the kitchen and enjoyed supper with my parents. Friday morning we got up and made our way to Jeremy's parent's home. Our plan was to spend most of the day with them then go back to my parent's to meet my sister and her family and my brother and his son. Friday was fun for us. We finally had Christmas with Jeremy's parent's. We had hoped to do it sooner but since they help take care of Jeremy's grandma, and the weather has been so bad....it hasn't worked out. We went up to Grandma's house first. Grandma (Claire) is 92 years old and has good days and bad. Friday was a good day! Grandma is a little forgetful so the note at the light switch is for her benefit. Selah found a rotary phone and was amazed! Selah was a little shy at first but soon relaxed. 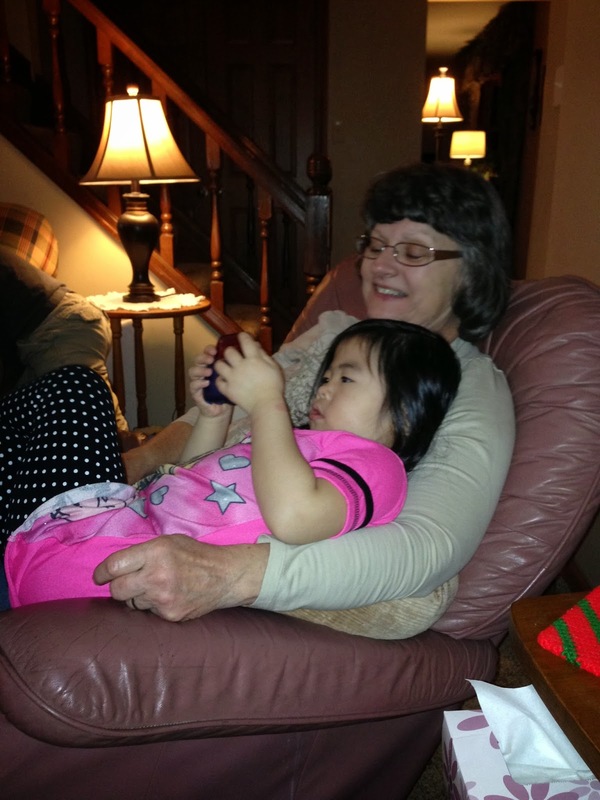 Personally, I love this photo of Selah and one of her great-grandmothers. Then I saw Mariah and Jeremy with Grandmas as well. Mariah found the kitty toys there as well. Great-Grandma Leard with six of her eight great-grandchildren. We then headed over to Uncle George's and Aunt Mary's house for a few minutes. It was lunchtime so we headed back to Jeremy's parent's. For one afternoon it was Christmas again! Selah enjoyed opening gifts again. It was fun! Selah and Rebecca also received a special gift from friends. Those bracelets were worn to church today! We then headed back to my parent's in time to have supper at 6:30 and have Selah meet my brother-in-law Daryl and my sister Tina and their boys. Then my brother came as well with his son, Dan. We managed to get this photo of 10 of my parent's 18 grandchildren. How else do you gather 18 people together? Well....you spoil the little ones! Notice the time on the clock reads 9:15pm? Aunt Tina........I forgive you! Then of course it is Grandma's turn. 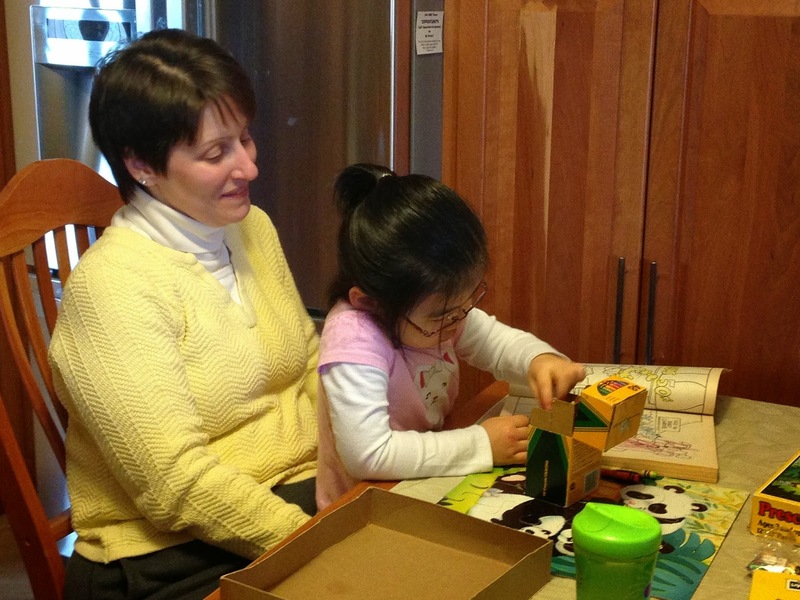 Aunt Patty came over on Friday and Mariah sat on her lap for at least 45 minutes coloring. But really......who can resist three-year-olds as cute as this? Even Rebecca got in on the spoiling! Mom and dad heat their house with a coal furnace. 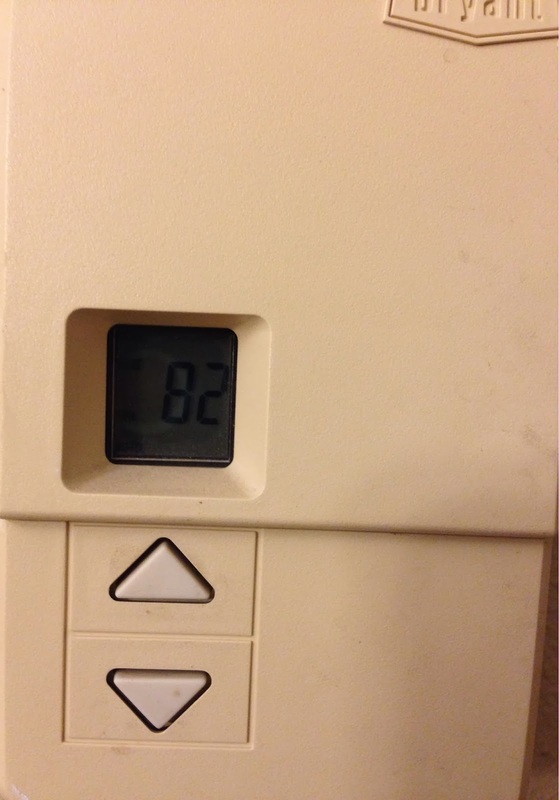 As anyone in my family can testify....the house is usually a balmy 80 degrees or more in the winter. My dad loves to see how hot he can keep the house. Ninety plus degrees is not uncommon. For this very reason the screens never are taken out of the windows. In fact if you happen to visit my parent's house even when it is below zero...it would not be uncommon to see open windows. Because my dad does not read my blog it is safe to admit that we sleep with open windows and prop open the front and back doors more often than he knows. Mom has had some wildlife attempt to come in the doors to warm up when they are propped open. (Again, my dad does not read this.) And dad, if you happen to stumble upon this please know that I love you! We are just hot at your house. We are blessed to have such great families who love us. We love to go home and visit and pray that our kids always have the same excitement to go visit their grandparents and our families. I hope that our next visit includes a visit to my grandmother. She is 93 years old, lives alone, and still drives. She has 15 living grandchildren and 30 great-grandchildren! What a legacy! We feel so blessed to be a part of such a large family. Obviously Jeremy and I are creating our own large family. We have confirmed that love truly multiplies. 1 Corinthians 13:13 So now faith, hope, and love abide, these three but the greatest of these is love. Friday was Rare Disease Awareness Day and I would be remiss if I did not dedicate this post to my sweet girl, Mariah. 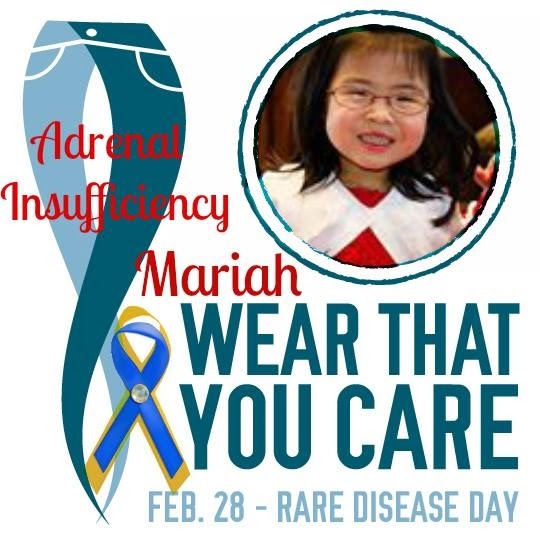 We were fully aware of Mariah's Adrenal Insufficiency before we committed to her file. Quite honestly it really didn't matter. We knew she needed a family and we were called to adopt. We thought we knew a lot about this disease before traveling. We were wrong! In fact, we are still learning. I dedicate many evenings researching this rare disease. In short, Mariah's adrenal glands do not produce the life-saving stress hormone, cortisol. As a result any illness or trauma put Mariah's life at risk of an adrenal crisis. Here is a different logo made by a friend recognizing Rare Disease Awareness. Thanks Laura, for making these for me. After much research and priceless friendships with a few other mom's of children with adrenal insufficiencies we decided our first endocrinologist was not a good fit. We tried. We begged. He was adamant that his treatment plan for Mariah correct and we should just listen to his recommendations. After calling other endocrinologists in-state, we gave up. Another mom, Kimberly, got of hold of her endocrinologist who is the head of the Pediatric Endocrine Society. He came back with one recommendation. We emailed this doctor and she returned our email within 20 minutes. Pittsburgh Children's Hospital was our new place! Our insurance has denied her coverage. We appealed their decision three times and have been denied each time. We even wrote a very strongly worded letter to the medical director. We explained that we have tried the doctors here. We are not interested in our daughter being a doctor's guinea pig while he/she at some point attempts to treat our daughter with inadequate or outdated information. We decided that Circadian Rhythm dosing made the most sense. This dosing schedule mimics how healthy bodies naturally produce cortisol. We dose her 4 times daily. It has become a way of life for us. As a result of tweaking those doses and checking labs every few months we have continued to successfully lower her dose of glucocorticoid medication. 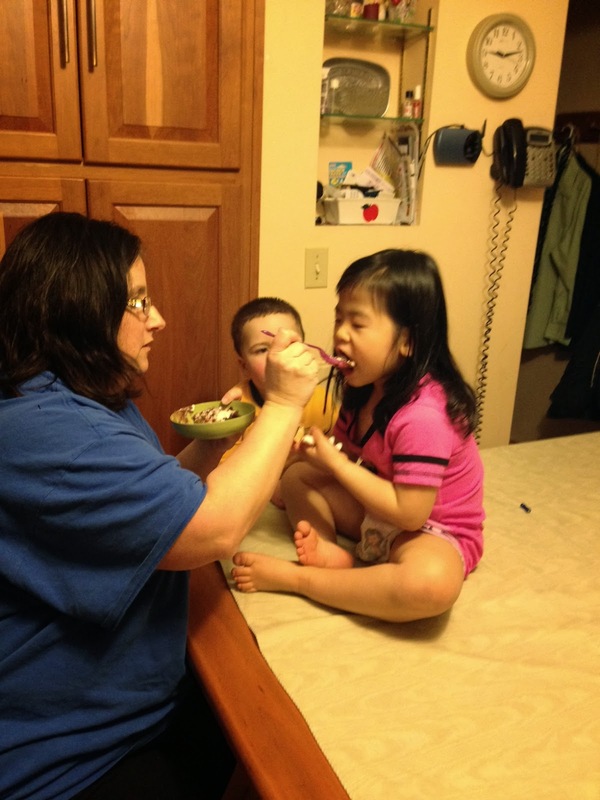 When she is sick, we have to double or triple her dose and give her medication every 3 hours. This while praying she does not go into an adrenal crisis. We witnessed a crisis last June. We are not interested in watching our daughter suffer through a crisis again. 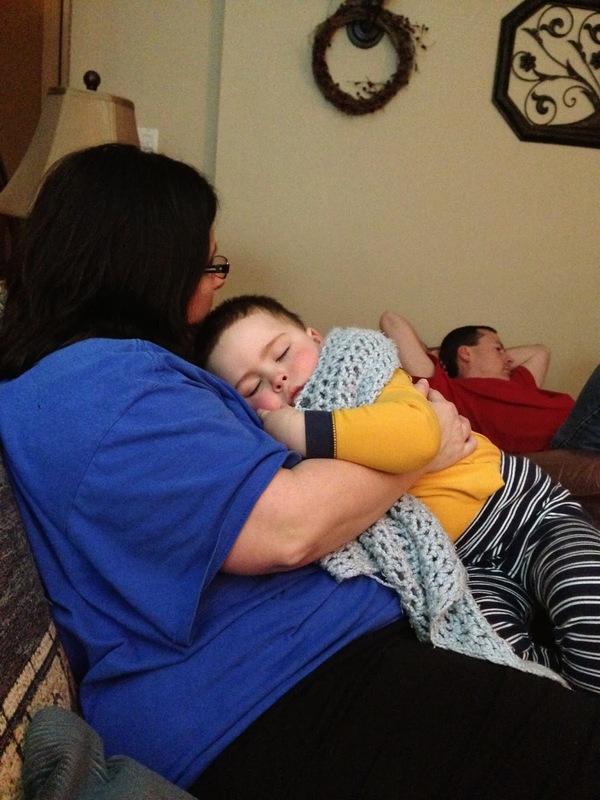 She became listless and mostly unresponsive in our arms. It was scary. We had to give her an intramuscular injection of Solu-Cortef in her thigh. She barely flinched. It was not fun. We would love for others to become a little more aware of the seriousness of this disease. It truly is life-threatening. Since it is a deletion in her DNA, there is no cure. She will always be dependent on hydrocortisone. This is why she wears a medical bracelet. Please pray for us as we navigate the whole process of insurance and education. As a result of Mariah's poor medical treatment from our first doctor, she had hypertension, a voracious appetite, and weight gain. She is now managed beautifully and has normal blood pressure, is a healthy weight, and is a healthy eater. We have six kids but have birthdays in four only months.......January (2), February (1), June (1), and December (2). If we decided on a Family ring that would add another January and December stone. We did not plan that very well! 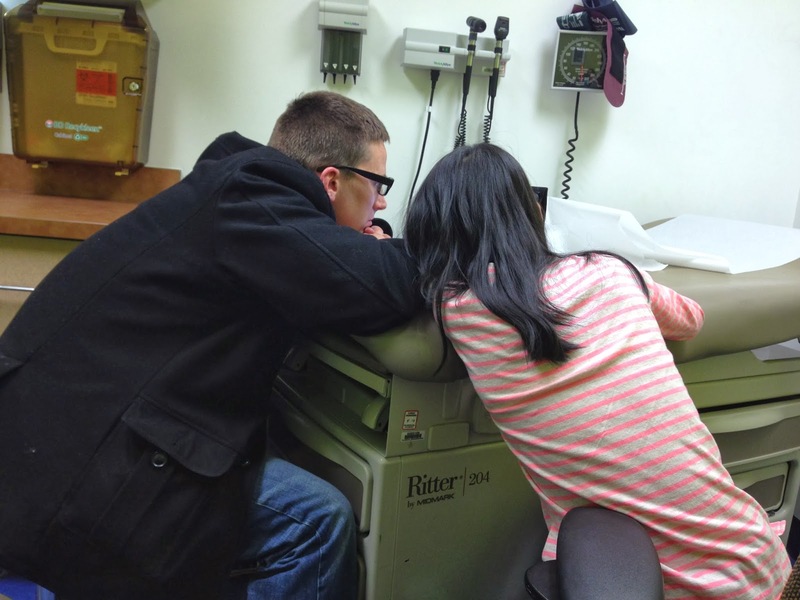 Friday included a trip to the hospital for Ben's echocardiogram. It is more than safe to say he had a tough time lying still for the echo. Hopefully those results come early this week and we can scratch cardiology off of Ben's list of doctors he needs to visit. They were actually getting along! She was wearing Ben's robe as well. One evening at dinner Selah decided to jot down a few things in Chinese. I thought it was so sweet that I kept the napkin. She wrote Jeremy's name and mine in Chinese. Then she drew an arrow and wrote the initials of all of our kids.....K.M.B.B.M. Then she wrote her name in cursive. I also discovered that she prints beautifully but never learned cursive as there really was no need. Selah has managed to figure out her own name in cursive by looking at the adhesive writing strips on the kids' desks. She is one determined girl! I will be dedicating the next few weeks to teaching her cursive handwriting. This weekend we also saw the first tears from our girl. We had a conversation with her about a few of our concerns. She cried. Parenting a hurt child is a completely different experience. I can throw out everything I have learned raising all of our biological kids over 15 years. Grace, compassion, consistency, and patience are a must. We also decided it was time for her to attend Sunday School class. Selah did not want to go into the classroom. However, after a few minutes she relented and attended Rebecca's class. She returned to the church service all smiles. Tonight as I hugged her goodnight and told her how much I loved her she hugged back. Then as I turned to walk away she grabbed me by my shoulders and hugged me with the biggest heartfelt hug I have every received from our sweet girl! She said she loved me!!!!!!!!! I've seen it in type before but never heard her say it. She also has more often referred to us as "mom" and "dad". It really is music to our ears. Jeremy and I are amazed that our daughter is not bitter. She has every right to be considering all she has endured. However, she has begun to open her heart and allow us in a little at a time. She is sweet and compassionate. She can love! She is beautiful! She is ours!